Federal Communications Commission Chairman Julius Genachowski will deliver a speech on Monday that sources say will outline a plan to adopt new net neutrality rules. According to a report published by Reuters, the FCC chairman's plan will seek the adoption of new rules intended to ensure that ISPs can't arbitrarily block or slow down their customers' access based on content. The concept of net neutrality maintains that ISPs, including both broadband cable and DSL providers as well as wireless mobile companies, must deliver data to their customers irrespective of its source, destination, ownership, or the protocol used to deliver it. Currently, many ISPs block or filter customers who use P2P applications. Advocates of net neutrality argue that without regulation, ISPs may eventually seek to sell artificially limited access to specific sites or discriminate against competitors by offering access priority to their own services while slowing access to competitive offerings. 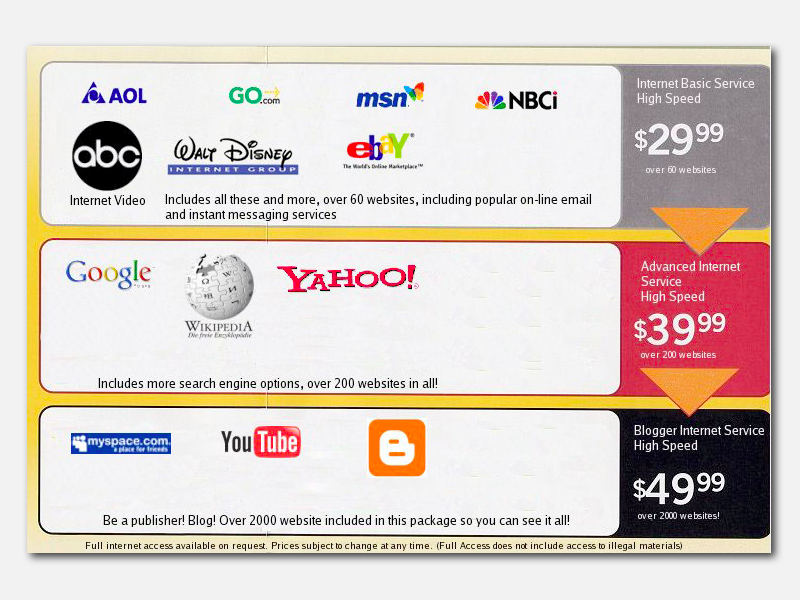 Without net neutrality rules, ISPs have the incentive to create monopolies of content and services, or to sell tiers of services where users must pay extra for full access to the Internet, a concept illustrated in a spoof advertisement circling the web (below). The FCC issued a policy statement in 2005 that outlined four non-binding "policy principles" on open Internet access, stating that consumers are entitled to open competition, access to any lawful content, the ability to run any applications or services, and the use of any legal devices on their network that do not harm the network. Last year, Google asked the FCC to require that operators bidding in the 700 MHz spectrum auction agree to open their networks to any application, any devices, any services, and any networks. The FCC agreed to support open devices and open applications, but not the latter two. Last August, the FCC voted to uphold a complaint filed against Comcast which had ruled the cable provider had illegally blocked its Internet subscribers from using BitTorrent file sharing software. Comcast challenged the ruling in court, saying the FCC does not have the authority to regulate its actions on the Internet. Monday marks the deadline set by the court for the FCC to respond to the challenge. The FCC is expected to argue that the agency has broad authority to regulate ISPs under the 1996 Telecommunications Act. Net neutrality became a minor issue in the 2008 US presidential election, with Barack Obama officially supporting the policy of net neutrality, and John McCain saying that big network operators should have the right to limit their customers' options if they could profit from doing so. "When you control the pipe you should be able to get profit from your investment," McCain told Google CEO Eric Schmidt in a campaign interview. Genachowski served as President Obama's technology advisor during the campaign before being appointed as FCC chairman this summer. The Obama administration also added openness requirements to the $7.2 billion in broadband infrastructure investments included in its Recovery Act stimulus bill. Opposition to the principle of net neutrality is commonly voiced by cable and telecom companies, right wing think tanks such as the Cato Institute, and astroturf advocacy groups such as "Hands off the Internet," a site financed by AT&T and "Citizens Against Government Waste," a nonprofit group linked to Jack Abramoff. CAGW previously made headlines after it mailed form letters supporting Microsoft in its antitrust lawsuit, addressed from concerned citizens who turned out to be dead people. While Apple generally benefits from the principle of net neutrality, its partnership with AT&T has resulted in at least two issues that concern the principle. The first is Apple's rejection of the Google Voice app on the iPhone. The FCC has been investigating the incident to determine if Apple's decision is effectively being made by AT&T to restrict potential competition in wireless services. The FCC lacks the jurisdiction to determine what apps Apple must sell in its App Store, and Apple maintains that it has yet to even determine if it will approve some form of the Google Voice app. Additionally, it is possible for Google to deliver a web-based version of the app on the iPhone without Apple's approval, clouding the issue of whether the dispute is actually an issue of net neutrality at all. Apple does ban VoIP applications from using the iPhone's mobile network, a policy that is clearly related to carrier demands and may likely be affected by new net neutrality rules. The other issue that the FCC is investigating concerns exclusive sales of phones on specific providers. Apple's exclusive deal with AT&T has brought that issue to the forefront, both for users who want to use the iPhone on other providers, and for small regional providers who lack the clout to make similar deals. Technology constraints also factor into the matter, as the existing iPhone simply can't work on the CDMA networks run by the Verizon and Sprint, the providers most affected users would like to be able to use it on. That may change in the next several years as Verizon and AT&T both build out compatible new LTE networks. The FCC chairman's new proposed rules addressing net neutrality are likely to only involve broadband and wireless ISPs. The agency has not yet commented on the other issues still under investigation pertaining to VoIP competition on mobiles and exclusive handset sales.